Apr. 2, 2015 11:00 a.m.
On Thursday, March 26 the Nisku-Leduc Rotary were pleased to present the Host Committee of the 2016 Summer Games with a sponsorship cheque of $30,000. 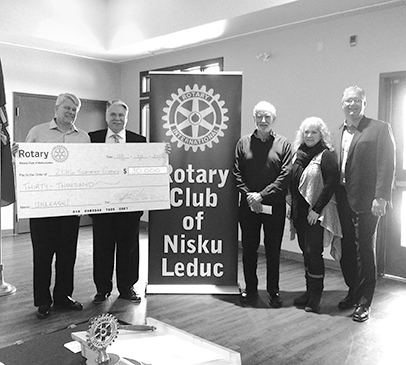 The host committee is very pleased that the Nisku-Leduc Rotary have taken the lead by donating to the Summer Games and hope that other service clubs will also contribute. Leduc will see approximately 3,000 athletes, coaches & training staff come to our community with most of the sports taking place in the LRC, Lede Park & Telford Lake area. An event like this requires the support and help of many volunteers. Look for the call for volunteers in early 2016 if you are interested in getting involved. The Nisku-Leduc Rotary Club meets every Thursday morning @ Redtail Landing at 7:00 a.m., please feel free to join us for a free breakfast and check us out.